Enron. Lehman Brothers. And now possibly Glencore? That was the discussion among financial markets participants as commodity prices took another hit and the Anglo-Swiss natural resource giant saw its share price collapse by 29 percent on Monday. Glencore’s investment grade bonds are trading like junk bonds as credit default swaps (CDS) rose to levels of a CCC-rated company. In many ways, Glencore seemed to be going down the path of bankruptcy with potential spill over effects to its industry and maybe even beyond. Financial markets can be quick to judge and when companies get caught in the negative feedback loop of speculation about business viability, lack of confidence in the company, and outright fear. The fall in the price for commodities due to weakening demand and oversupply as global growth falters largely due to China’s economic transition have sent economies like Canada’s into a technical recession, but when combined with a high debt load, those factors almost brought down a company like Glencore. It was a leveraged bet on commodity prices made at the wrong time. Glencore’s share price is down nearly 80 percent over the last 12 months. The Bloomberg Commodity Index is down 26 percent over this same time period. The kicker is debt. Can Glencore keep servicing this debt if commodity prices remain low? Investment bank Investec Securities said that with ongoing low commodity prices, all the earnings would have to go to paying interest on its massive debt load. The shares would be left virtually worthless. Goldman Sachs provided a scenario analysis showing that if commodity prices fell 5 percent, most of Glencore’s credit rating metrics would, “fall well outside the required range to maintain its investment grade credit rating. An investment-grade credit rating is critical to Glencore’s commodity-trading business as it needs to be seen as a credit-worthy counterparty. If other firms don’t believe Glencore is credit worthy and can’t meet its short-term obligations, they won’t trade with it. This could lead to a Lehman-like scenario. Glencore went public in 2011 when commodity prices were at their highest levels in the last five years. A handful of executives became billionaires on paper. China was growing by 10 percent a year. The Swiss-based company was known for its sophisticated commodities trading. Glencore’s trading has also been called secretive and it has been compared to Enron, being called “Glenron,” though there hasn’t been any suspicion of fraud. When times are good, companies invest and grow. The opposite equally rings true. Just like the oil companies investing big in Canada’s oil patch early this decade, Glencore acquired Xstrata, a mining firm it had once spun off, for US$30 billion. That’s where the debt load comes from. It was a leveraged bet on commodity prices made at the wrong time. 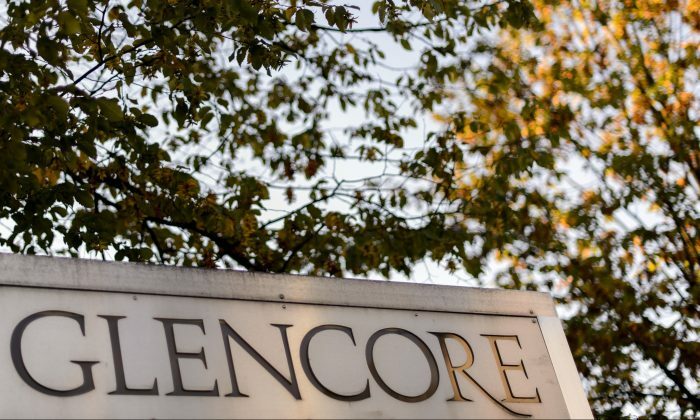 On Tuesday, after Monday’s share price plunged, Glencore put out a short press release. “Glencore has taken proactive steps to position our company to withstand current commodity market conditions. Our business remains operationally and financially robust. We have positive cash flow, good liquidity, and absolutely no solvency issues,” said the company. Glencore’s stock surged after Tuesday’s reassurances, though it has a long way to go to recoup its losses this year. It needs copper prices to rebound. With commodities in the dumps, the company raised $2.5 billion in additional equity in mid-September to pay down debt. It has over $30 billion in debt and a market capitalization of $20 billion. It is also making plans to sell some business lines, cut jobs and production in mines. It has already cut its dividend. Again, just like the oil companies in Canada’s oil patch, desperate times call for desperate measures. Regulation since the financial crisis has overwhelmingly focused on banks, but commodity-trading firms that have escaped the scrutiny and capital requirements should expect a changing landscape in light of Glencore. “If Glencore is able to successfully execute all of its announced measures to reduce net debt it would be able to alleviate concerns about its credit rating. However, to get to this point we believe investors would need to see more definitive action,” according to a Goldman Sachs Sept. 24 note. The other possibility is that Glencore goes private, as Citi reiterated in a note on Tuesday. However, this would require more debt. It’s not hard to see the similarities between Glencore and the commodities super-cycle with rising real estate in the U.S. early last decade. Banks, mortgage companies, rating agencies, and investors were all riding a wave until house prices stopped going up. That didn’t end well. It looks like it will be a white-knuckle ride for Glencore for the foreseeable future. As China’s top economic officials announced slower economic growth forecast, the commodities markets are bracing for another rout in 2015.
Commodities giant Glencore International Plc is currently in talks to buy out Xstrata Plc to create one of the world’s biggest mining companies. Glencore International AG is looking at a possible merger with Xstrata Plc.